The Spirit 1.0 is perfect option for tenders, small racing yachts and daysailers up to 1.5 tons. • Normal use running time 4 to 5 hours. • Charging time 5 hours. • Designed for salt water use. • Silent Brushless DC motor. The 1KW Lithium-ion battery of SPIRIT 1.0 delivers the most charming performance of its kind. At full speed, one battery works for up to 1 hour; but for leisure cruise, it usually lasts 3 to 5 hours. Thanks to its detachable design, you can bring alternate batteries on board to extend your sailing time. SPIRIT 1.0 features gearbox free design and optimized motor structure. The high quality brushless DC motor with a max efficiency of 90% helps SPIRIT 1.0 achieve an overall efficiency of more than 50%. And without gearbox, this electric outboard motor will greatly lower Ãœ even eliminate noise and save maintenance troubles that often bother the owners of gas outboards. Thanks to the floating design, the elaborately designed Spirit Battery is unsinkable, totally eliminating your concerns in this respect. The battery locates on top of the outboard to save valuable space for the boat. Its self-contained design makes it easy to replace a backup SPIRIT Battery on board with 2 simple steps if the original one is running out of power. This smart screen keeps you informed of all essential information you need to know during the journey. Real-time voltage, power and remaining battery is indicated as primary parameters. Only 2 steps are needed to have the battery installed. First, place the battery on battery base. Then plug power cable into the power socket on battery. 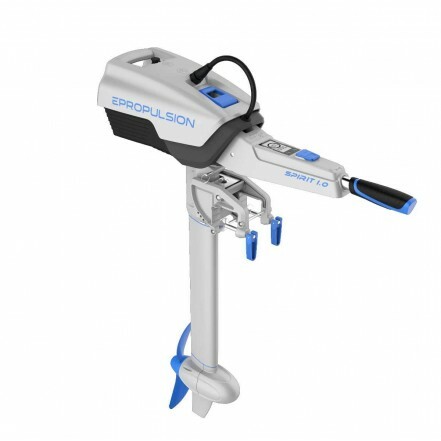 This 3HP foldable electric outboard motor weighs only 7.75kg. It&apos;s designed to be portable so you can lift the motor by one hand and carry the battery by the other with ease. The stepless throttle handle with forward, reverse and stop capabilities brings you a wonderful steering experience. With connections and components satisfying IP67, Spirit 1.0 can operate even if immersed in water. When detached, the battery won&apos;t have any output to protect the electric outboard motor even if the connectors are all wet. With Wireless communication, the Spirit can be controlled remotely. Remote option only. • Magnetic Kill Switch x2. • Steering Lock Pin x2.